Getting the right (external) partners in an enterprise is almost as important as doing things right yourself. In fact, organisations that develop the right partners for their core processes consistently over a period of time develop a strong differentiator and source of strength. A good example - Maruti Suzuki Ltd. On the other hand, organisations that fail to do so keep struggling, keep striving just to de-bottleneck on a regular basis. External partners are also knows as associates, channel partners, vendors, joint venture partners etc. depending on the depth and extent of engagement you enter into with them. I have had a whole range of experiences with (external) partners over past 16 years. These range from the miserable to the heavenly, from the pitiable to the praiseworthy. At times we have lost time, energy and resources trying to develop some of them. At times, we have succeeded big time, and have developed enviably beautiful relationships. So what are the ingredients of a successful partner development strategy? This post is not on that, but a few quick tips - trust, patience, and foresight. More on that later. Let me share my experience on the fishpond I have in my cabin. When we were putting up the new facility of PT universe, the architect proposed we put a big fishpond in my cabin, with exotic marine fish. Fortunately we decided against marine (sea) fish, and decided to go for regular ones (although slightly exotic). So we imported this huge tank from China (almost all fishponds are, nowadays), and got a local Indore fish vendor to supply the fish, and maintain the pond on a regular basis. I learned some lessons here. Fortunately, we were able to get things in shape once more. Another partner I got a chance to work with is the National Enterpreneurship Network (NEN). All I can say is - it is a superbly driven and inspired organisation run by some of the most selfless people I have met. Their drive to create enterpreneurs is quite extraordinary, and their achievements so far are quite solid. One of the things I liked the most was a comment by their senior functionary. In a meeting, he shared that he would like to bring (for a guest lecture to PT universe) a successful enterpreneur who has built his enterprise from scratch and now has annual revenues of .... guess? .... of more than Rs 40 lacs! I was impressed. Only someone with a lot of depth can take pride in that kind of a figure. Normally, to impress me, he would have quoted figures running into crores. But the innocence and genuinity of that interaction made me realise that this organisation was worth working with. So I committed some resources to working with them. We are trying to collaborate on some important things. One such thing is the National Enterpreneurship Summit scheduled this weekend at Indore, which will feature six new-generation CEOs. Overall, an interesting summit this should turn out to be. I will update my blog on Saturday night (on this event). Since you have reached this far, let me share a very personal experience with you. "One of my ex-employees who was heading a team, left the company in a huff some years ago, over a major difference of opinion. We pleaded that he complete his handing-over responsibilities properly to the new guy in-charge, and complete one very crucial external engagement assignment before leaving. I personally, literally, pleaded before him. He just did not budge. His words then were - "Sorry sir there is no point in discussing all this! I am leaving, and that's it." So, left with no choice, we settled his account and bid him a pleasant goodbye. Due to the unprofessional transitioning, we incurred heavy losses. Today, I got an email from that person (a cheerful email) declaring he has started his own software business and wants to sell an institutional management software to me. Imagine! He wants me to trust him now! Unfortunately, that is no longer possible. He has lost that golden opportunity. I was discussing with my senior colleagues today - if only he had given us a painless transition then, today's contract could probably have been his. As it is, we are looking for an ERP for PROTON and SBM. But that guy? Forget it! Even if he is the last ERP vendor in the world, we won't consider him. This is not because we don't like him as a person.. he may be great, but it is because he has lost all credibility. This thing - CREDIBILITY - is everything in business decision-making. Even if you have to incur some short-term loss today just to fulfil your promises, try to do justice to it. At least don't run away abruptly from your duty! Remember friends - if you ditch someone (especially your employer) badly today, you are likely to lose some BIG opportunity tomorrow. Life has a way of getting even. That's why my guiding principle has been - never be unfair to anyone, never under-deliver on any promise made, and never let anyone take you for a ride either." You see, it is always a good idea to fulfil the commitments you make. yesterday by leaving a comment in your post (Joy Of discoveries), pursuing his MBA in IT(1st year) from Symbiosis,(SICSR). Thank you very much sir, for sharing your experience with us. They are very much valuable to people like me as I want to be an entrepreneur and hand also help my father in running our familly business. 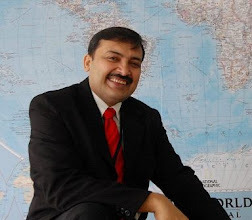 I am Keyur Joshi again[Symbiosis(SICSR MBA-IT 1st year)]. Thank you very much sir for your valuable experience which you shared with us. It says that the kind of difficulties one may face in their business, even one has not even thought about it[Fish Example]. Furthermore, one should always be responsible towards their organisation whether he/she may be in any of the difficulty. Thank you again, for your valuable information. Manu, through your fish and your pet-care vendor, I am once again reminded of our utter deficiency as Indians at maintaining the things we start or create. It seems we do not think through or plan through the maintenance phase. When I lived in Bangalore in the late 90s, I happened to have Shri C G Krishadas Nair, Chairman of HAL, as my landlord. He seemed to be a very nice person and I remember our conversations on this very subject. Imagine someone as powerful nationally as the Chairman of HAL, someone whose company was involved with billions of rupees worth of national security hardware, forced to struggle against the fact that we as a nation were bad at maintaining what we built or what we had acquired! It was great insight by you that learning can be through anything in life. Very nice articles and thoughts, encompassing a wide range - that is the real learning. Am sure PROTONs are much the wiser for this education, beyond mere academics. "When a fact is heard for the first time, it enters the mechanical part of the mind, which stores it up as memory. If it remains only in that section, it is never really understood, though a man may feel quite sure he has mastered it. He will then also mistake parroting for wisdom, which means he will say one thing but live by another. While living is certainly for learning, the time must come when learning turns to living." Today also, I have great learning from this article.The person You have mentioned is not a true professional nor he is loyal to his enterprise and left the job at very crucial time. As it is said " A friend in need is friend indeed",so he is not right on this point and even not honest to his enterprise. "Duniya Gol he" means you will reach the same point where you left it,today he wants help from the same enterprise to whom he is not honest in the past.But he will get nothing out of it because "A bad man is better than a bad name", and he have earned a bad name for himself in the past and the same thing can apply for that vendor. So the first learning is honesty to your work and enterprise,second earn credibility.So if you are not honest,loyal and not credible than you may have to pay a bigger price. The experience of the ex-employee that you shared was wonderful, its worth taking note of. Hi Protons Chetan, Shoaib - these experiences truly teach a lot. A caution though - life is complex. People's behaviour can be governed by a very large set of variables. Our experience with someone may reveal only one facet of it. So, do take "my" experiences with a pinch of salt. The way they play out in your lives may be different. Cheers! In most of cases we have to struggle for after sales services.It is the same thing which you experienced during Mandu trip about museum that we Indians are very good at creating but bad at maintenance part. Specialy in case of IT, more than 95% are just equipment provider very few are solution provider. Thanks for translating you experinces about vendors and credibility of person. the employer ditch several times the employee. Both are bad , but on part of an employee it bring down ones character. entrepreneurial legends will offer there words of wisdom. I enrolled myself for it but unfortunely can't make for it .. Thank you because you mantion in your blog what you learned. Hi Praveen, Ashish - thanks for readind and commenting. Your points are interesting. Bhupendra - yes, why not! Some people marry only for that! Ha ha.. Regarding employer and employee ditching each other, it's bad, no matter who does it and for what reason(s). It was another wonderful reading. Thank you for sharing such experiences which shower words of wisdom upon budding future managers. Sir, I also learnt that fulfillment of commitment is paramount for build everlasting relations. And lastly, the more I learn about you the more I tend to respect you. Sir, the way you judge people and respect them is exceptional. I would love to emulate you in my endeavours and would try to be as noble a human being as you are. Thanks for inculcating these human values in us, which our society is losing these days. Thanks Munish for your extra-kind words! I must confess - I have had my solid shares of mistakes (still do), and I am just an ordinary human being with all impulses & emotions that everyone possesses. Maybe the only thing I am good at is I learn fast, and have realised that before anything else, respecting humanity is what keeps one ahead in the race. Hi Keyur, Vipul, Chetan - good to see your regular reading of this blog. Please do suggest topics of interest to you, and I will try to write on them as well. Best wishes! Thank you for giving us chance to suggest topics. I want to know something about "How to be happy always"? Whether conditions are in our favor or not. I would like to ask two questions. I asked these from Manas sir too. I want to know how to recognize happiness in sad days. Because in sad days I just get depressed and in depression i can not understand that how to be happy again. please suggest me how to improve? Present happiness is important or future happiness? Sir I have to take a decision on which my present & future happiness depends. If decision goes good for present happiness then it can harm me in future. But if i would go for future happiness then it will harm me in present. Please suggest how to decide? Dear Deepesh, I can go on writing on this topic. Experience has taught me so much about it. Quick tips for you : 1) do not link happiness with size of event/moment/achievement. Happiness is happiness. There's nothing like small happiness or big happiness. A bird's chirping can give joy, just like a job offer can. It's all in the mind. 2)When we start realising that the world is far more beautiful than we can begin to imagine, wonder and joy come together. 3) Live for the moment that is. From a metaphysical perspective, there is no tomorrow, really. I say this because we cannot predict anything about it, except that we can't be sure of it. So our existence is practically locked up inside the moment that is "now", that is "here", that is "under your control". Look at children. They are always happy. And such small things make them happy. Stones, pebbles, flowers.. they can play for hours with these. Without complaining. Maybe there's a lesson in it for us. Lasting joy truly lies in appreciating everything that's around us, and the fact that you can appreciate it (a healthy body that allows you to do so). The ancient Chinese (Song Dynasty) is the first civilization thought to have kept aquarium fish for ornamental purposes. Even earlier than the Chinese though, civilizations were keeping plenty of fish in various types of holding containers for food purposes. hopefully this can help others enjoy this great hobby. The Convict Tang ( which you are having ) is a member of the surgeonfishes and is one of the most peaceful of the available tangs. They will need at least a 75 gallon tank (284 liters), preferably larger, to allow for adequate swimming space. They can be fairly hardy once acclimated but will not do well in a tank that has not completed the aquarium nitrogen cycle. You will also need highly oxygenated water provided through increased surface agitation (multiple power heads) and/or the heavy use of air stones. Convict Tangs are nicely colored with a white or yellow body and black vertical stripes or orange & red. They are frequently found schooling in the ocean and provided that you have a large enough tank, you may be able to keep multiple tangs in your saltwater aquarium. However, this Tang will probably not do well with other surgeonfish unless the tank is really large, 100 gallons (379 liters) or larger. This tang is one of the more peaceful of the bunch and may get picked on by other tangs that are already in the tank. They should primarily eat marine algae and having lots of live rock in your tank will provide plenty of grazing opportunities in between meals. Try to give them a varied diet and supplement their diet with marine seaweed using a veggie clip. They are somewhat disease resistant but you still need to take proper pre-cautions and use a quarantine tank before introducing them into your main tank. Keep them in the hospital tank for two weeks or so and watch for obvious saltwater diseases, like marine ich and make sure they are eating. Temperament / Behavior: They may be aggressive with other convict tangs in smaller tanks but may do ok in multiples in larger tanks. May get bullied by other surgeonfish. They also are constantly on the move and will need a larger tank for swimming space. Breeding / Mating / Reproduction: Very difficult to breed in captivity. Compatible Tank Mates: Use caution when selecting tank mates. Avoid keeping them with other species of tangs. Might be able to keep multiple tangs if you have a tank larger than 100 gallons. Introduce at the same time to limit territorial aggression. Diet / Fish Food: Primarily an herbivore and feeds on marine algae in the wild. Try to give them a variety of marine foods but predominantly marine algae.They should accept vitamin enriched flake foods, frozen and definitely live foods. For any aquarium to thrive, planning is crucial. As with humans, you can’t please everybody. But for fish, sheer unhappiness can be a matter of life and death. Maintaining compatibility in a fish community is no picnic. Water Chemistry Consideration: As if it’s not difficult enough ascertaining the right water chemistry, temperature and quality, you have to ensure your choice will make every inhabitant happy. Keeping check on the temperature should be high on your priority list as the wrong aquarium climate will affect your fish badly. Fish Food and Feeding Consideration: If you’re fussy about what goes into your mouth, fish are no different either. An all-for-one fish food will not work. You need the right food types for carnivores, vegetarians, or live-food eaters. Make sure all the fish get their food, and that the slow swimmers don’t lose out. Observe how fast different fish swim and eat during feeding sessions, as well as which are the surface and bottom feeders. Territorial and Aggressive Behavior Consideration: Fish size and aggressiveness should be taken into consideration if you intend the inhabitants to live harmoniously together. Aggressive or territorial fish are like bullies in school who chase terrified kids round the playground. Don’t mix aggressive and passive fish together. The aggressors will hog the food and eat it all leisure, bullying the shy ones into taking cover. Remember that stress is the main cause for illness. Don’t separate schooling fish: they will feel stressed without their mates. Different fish require different conditions. Some require hiding nooks among plants and driftwood, while others thrive better with sand than gravel. Last advice to you is to choose everything wisely. hope this will help you out in taking care of ur pet fishes. Dear Sir or Madam : thanks for your fantastic comment. It is detailed, and very helpful. Thanks for taking the time to write at such length. best wishes! Nice to read the experience of your life. You have shared with us two experiences of your life. One about fishpond and the other one about ex-employee. I found the learnings from these both experiences are really very Interesting and valueble for us. Thanks for sharing your valuable experience with us. Reading this article was a great insight for me just as the other articles. 1)Get only the experienced vendor. 2)Credibility is everything in business decision makings. That was a great piece of learning which i will always remember in my life. Credibility is an essential value which needs to be a part of your mind, body and soul. that was my learning from the blog. Thank you Sir.